Archie's Garden: Saving Water - The "Sprinker Toy"
Saving Water - The "Sprinker Toy"
California is in the middle of a terrible drought. 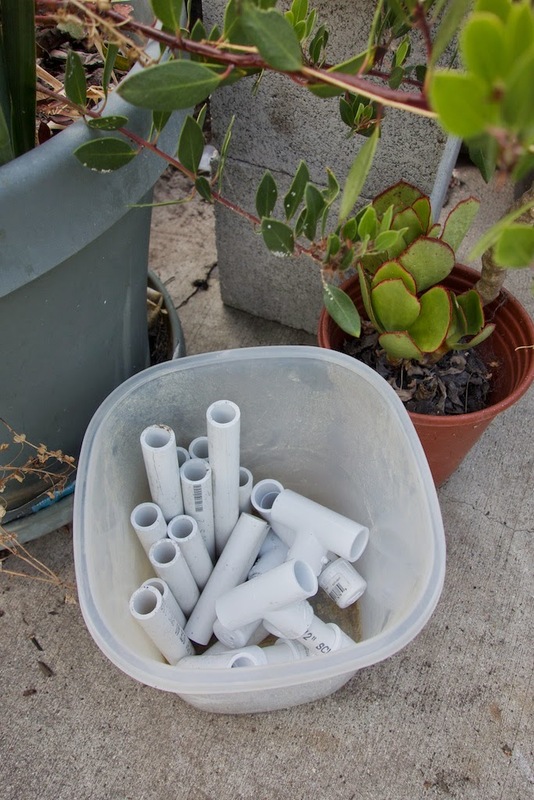 It's important to save as much water as possible, but we also want to keep the plants alive so the butterflies have some place to feed on nectar, lay eggs, and the caterpillars have something to eat. One way we can save water is by reclaiming "gray" water. Water is called "gray" when it's not straight out of the tap, but may have soap or other stuff in it that's not dangerous. For example, water from showers, tubs, and washing machines can be gray, but water from a toilet cannot. Another way we can save water is by capturing water that would otherwise be wasted, like using a bucket in the shower to catch the cold water while we wait for the shower to heat up. At Archie's Garden, one of the things we do is to keep a bucket in the shower. When it fills up, we use the water for the plants. 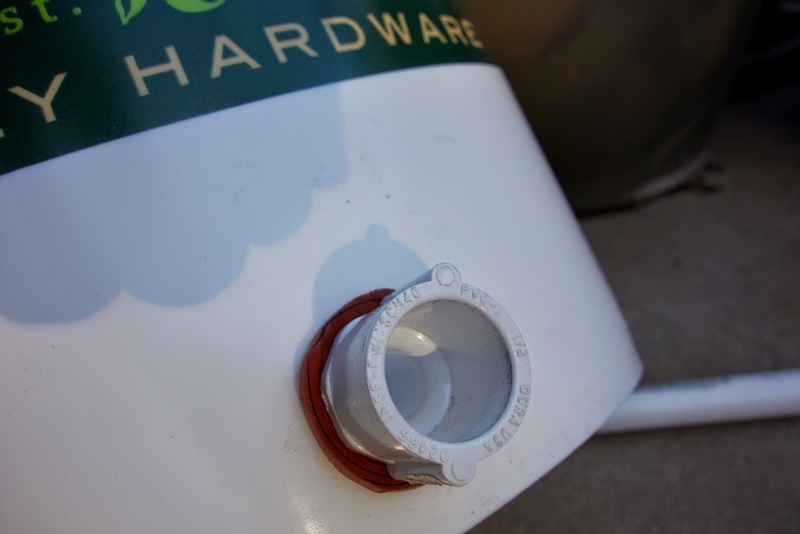 Distributing the water from a five gallon bucket, however, can be tricky - it's easy to pour too much in one place because the bucket is heavy. If you transfer it into a watering can, it takes more time and it's easy to spill. To solve this problem, we built a prototype of what we call the Sprinker Toy! We start by getting a five gallon bucket, and cutting a hole in the side. Using matching screw-threaded adapters and disks cut out of a sheet of rubber, we build a 1/2" PVC connecting port for "slip" style connectors. 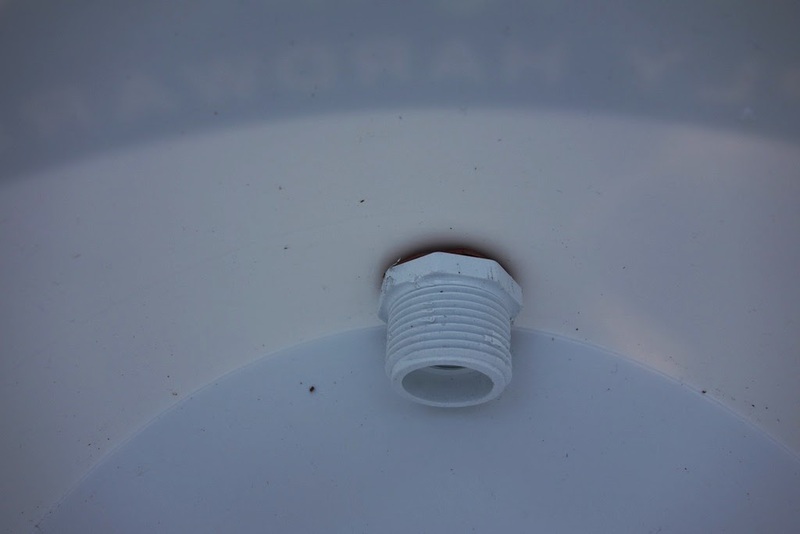 From there, we drilled a small hole in the end of each of a collection of 1/2" PVC end caps. 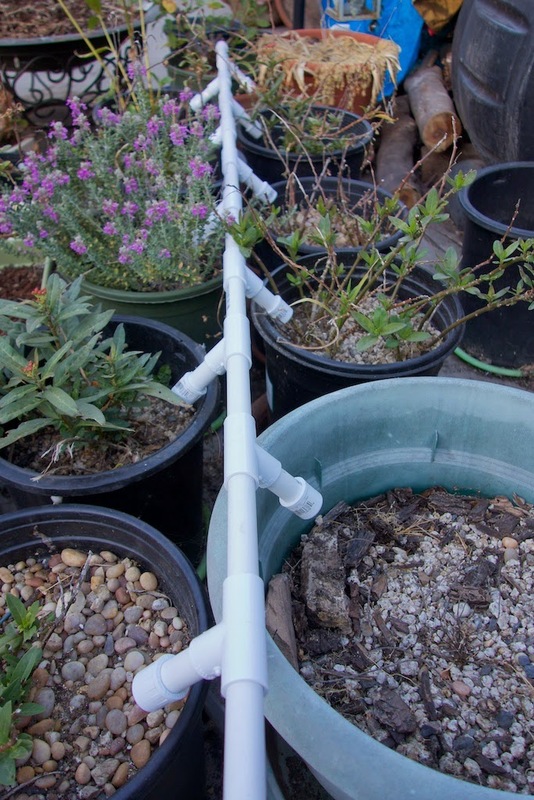 Cutting various short lengths of 1/2" PVC pipe, and using slip-tees, we assembled the sprinkling portion. Then we made a whole bunch more! This is where the Sprinker Toy name comes in. These little sprinklers get connected to each other like Tinker Toys! 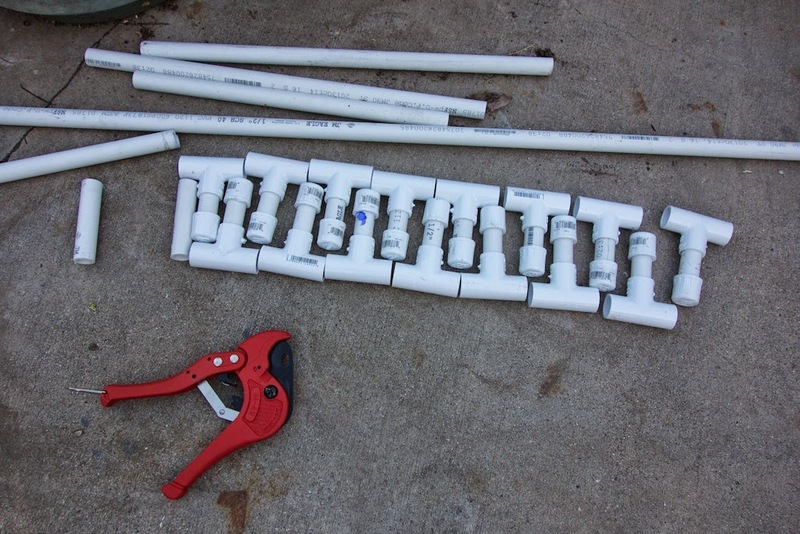 Using different lengths of pipe, the sections are easily plugged together to fit whatever layout you need. Tilting the sprinkler part downward guarantees that the water will pour out rather than sit in the pipes. We made extra pieces so that if we move Milkweed plants in or out of the Butterfly Fort, we can put them into the watering system. If you need to change the layout, it's easy, since the sections are just plugged together (and not glued, cemented, or otherwise permanently attached). The pressure in the system is very low, so you don't have to worry much about leaks. When you want to water, you just pour into the big bucket, and gravity does all the rest! 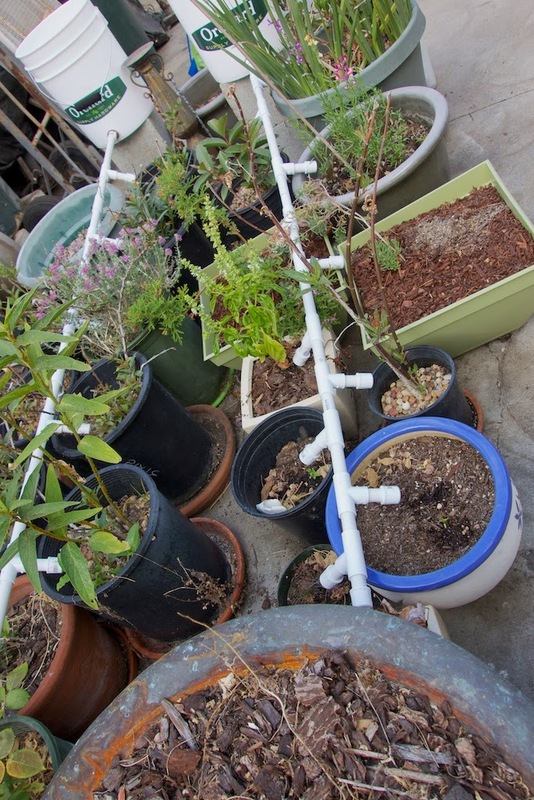 You can get fancy with this, by making sprinklers that work at different rates. You can vary the size of the hole you drill into the end-cap, or drill multiple holes in an end-cap. We used 1/2 inch PVC and connectors. The whole thing was about $15 in parts. 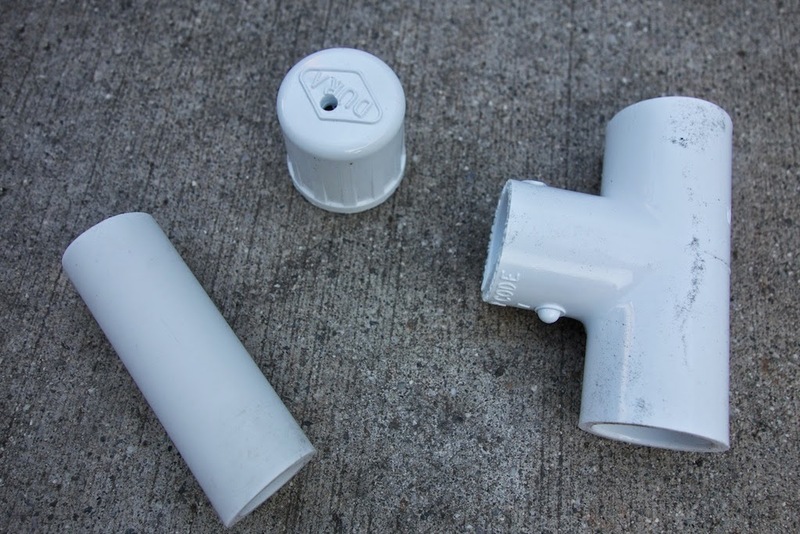 At many hardware stores, they sell bulk "contractor" bags of slip-tee connectors or end-caps. This is the technique I also employed in my garden but it was on much larger scale. Provides the best irrigation and reduces the amount of water lost and moreover its easy to use.